Charles Wright in action for Panthers. Heavy rain brought the action to an early halt at Monmore Green with the city side having been on the receiving end of 5-1s in the two completed heats. Team boss Carl Johnson said: “The rain started to fall just as went on parade and it came down heavily. “The conditions were already like a skating rink in heat one and they got worse in the second race with the riders in behind having no visibility at all. The trip to Wolverhampton will now be re-arranged with Panthers back in action tomorrow (April 11) when travelling to Belle Vue for another SGB Premiership Supporters’ Cup clash (7.30pm). The city men were initially due to travel to Manchester last Thursday before bad weather forced a postponement. 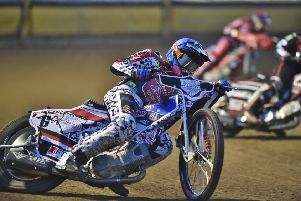 They then host Wolverhampton at the East of England Arena on Thursday (April 12) before launching their league campaign at Alwalton on Monday (April 15) when reigning champions Poole provide the opposition.